This is my favourite salad this season, hence why there are few pictures in this post: every time I make it I can hardly wait to shovel it into my mouth. It is SO GOOD. 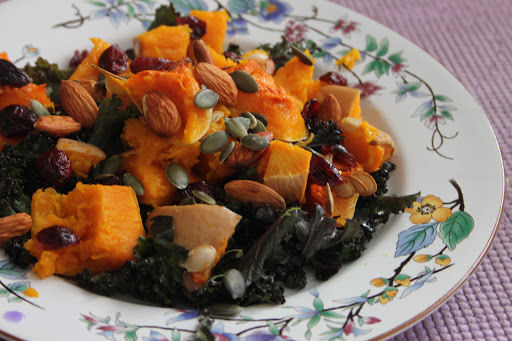 The kale provides the superfood element (Google it to find out its endless health benefits) while the roasted butternut squash adds depth of flavour as well as sweetness and tenderness. Nothing says winter comfort like roasted squash to me. Pumpkin seeds and almonds add some contrasting crunch and the dried cranberries bring a little burst of colour and unexpected tartness. It’s simply the perfect combination. Pre-heat the oven at 200ºC. Dice the butternut, but do not peel it. Spray some oil over the cubes, throw them in a roasting tin and roast for 30-40 minutes. I like to leave them in quite long because the skin starts to caramelise. Tear the kale leaves from the stalks and roughly shred them with your hands. Drizzle the olive oil over the kale. Massage with your hands for 5 minutes, or longer if you like. (I find it particularly relaxing, so I massage away for quite a while.) Top with the roasted squash, cranberries and seeds. Enjoy! Rubbish photography demonstrates how hungry for this salad I actually was. 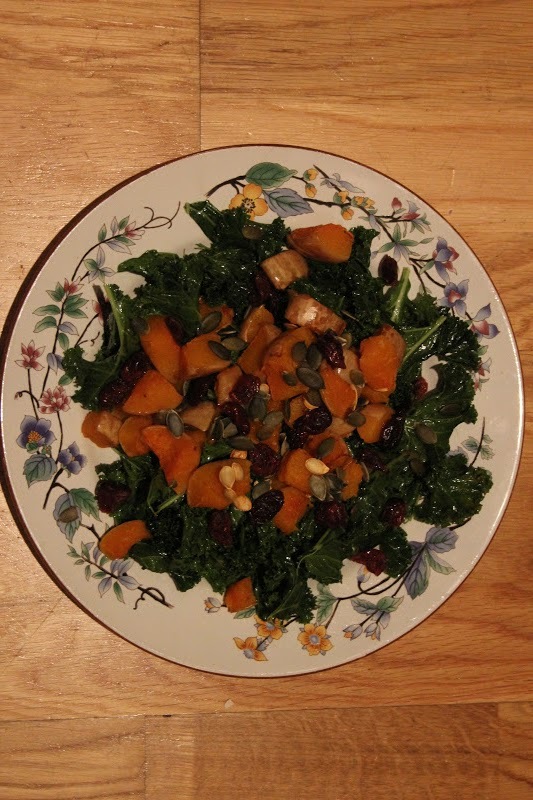 This is pretty much my favourite winter salad too!